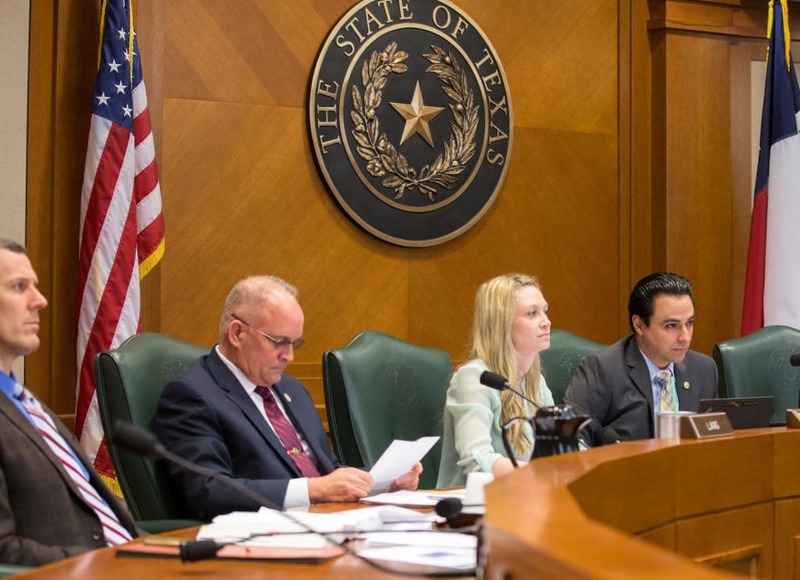 Featured, from left: Rep. Matt Schaefer, R-Tyler; Rep. Mike Lang, R-Grandbury; Rachel Wetsel, Clerk, House Committee on Criminal Jurisprudence; and Rep. Terry Canales, D-Edinburg. Canales was serving as Chair of the House Criminal Jurisprudence Subcommittee on Asset Forfeiture during its meeting in Austin on Wednesday, March 29, 2017. Rep. Terry Canales, D-Edinburg, along with a bipartisan supermajority of the Texas House of Representatives, wants President Trump and Congress to avoid any actions that would threaten almost $92.5 billion in annual Texas exports to Mexico, which is the largest trading partner for the Lone Star State. Exports are goods or services sent to another country for sale. Mexico’s relationship to Texas is so important to state lawmakers that they want to make sure their federal counterparts in Washington D.C. also don’t jeopardize hundreds of thousands of Texas jobs because of negative stereotypes or ignorance of Mexico’s roles in creating jobs and prosperity for all Americans. Through the use of a legislative measure, House Resolution 1025 by Canales, the Texas House of Representatives is urging the nation’s top elected leaders to recognize the huge significance of trade between Texas and Mexico. HR 1025 received overwhelming support on Thursday, May 4, 2017, from Democrats and Republicans in the House of Representatives, with 130 Yeas, 13 Nays, and 2 Present Not Voting. HR 1025, which also featured joint authors Rep. Mark Keough, R-The Woodlands, Rep. Alfonso “Poncho” Nevárez, D-Eagle Pass, Rep. R.D. “Bobby” Guerra, D-McAllen, and Rep. Richard Raymond, D-Laredo, comes as President Trump recently stated he is willing to renegotiate the North American Free Trade Agreement rather than end it. The legislator who files a bill and guides it through the legislative process is the author (also called the primary author). The Senate allows multiple primary authors for each bill or resolution. The House of Representatives allows only one primary author, the house member whose signature appears on the original measure and on the copies filed with the chief clerk. Both chambers also have coauthors, and the house of representatives has joint authors. On Thursday, April 27, 2017, during a meeting at the White House between President Trump and President Macri of Argentina, Trump was asked by reporters whether he still intended to dismantle NAFTA, as he had considered during his presidential campaign. “I was going to terminate NAFTA as of two or three days from now. The President of Mexico, who I have a very, very good relationship, called me, and also the Prime Minister of Canada, who I have a very good relationship. And I like both of these gentlemen very much. They called me and they said, rather than terminating NAFTA, could you please renegotiate? I like them very much. I respect their countries very much. The relationship is very special. “‘And I said, I will hold on the termination; let’s see if we can make it a fair deal. Because NAFTA has been a horrible deal for the United States. It’s been very good for Canada, it’s been very good for Mexico, but it’s been horrible for the United States. “And if you check my campaign – any of my speeches – I said, I’ll either renegotiate or I’ll terminate. So they asked me to renegotiate – I will. And I think we’ll be successful in the renegotiation, which, frankly, would be good because it would be simpler. But we have to make a deal that’s fair for the United States. “They understand that. And so I decided rather than terminating NAFTA, which would be a pretty big shock to the system, we will renegotiate. Mexican imports to Texas and the U.S. also are a key part of international trade that helps Texas and the U.S., Canales noted. Imports are goods or services sent from another country for sale in Texas and the U.S.
Inputs of an industry are the goods and services (including energy, raw materials, semi-finished goods, and services that are purchased from all sources) that are used in the production process to produce other goods or services rather than for final consumption. It equals the industry’s gross output (consisting of sales or receipts and other operating income, commodity taxes, and inventory change) less value added (consisting of compensation of employees, taxes on production and imports less subsidies, and gross operating surplus). Gus García, Executive Director of Edinburg Economic Development Corporation, pointed out that the Rio Grande Valley’s economy was not hit as hard as other parts of the nation during the 2008-2009 recession, according to the Rio Grande Guardian in its Wednesday, March 22, 2o17 story titled “Canales: South Texas is not a War Zone, it’s a Trade Zone”. The Edinburg EDC is the jobs-creation arm of the Edinburg Mayor and Edinburg City Council. The Edinburg EDC Executive Director said South Texas was spared some of the most serious economic downfalls during the so-called Great Recession due in part to trade with Mexico and international tourism. “We have looked at this extensively and we have been able to identify over the last ten years, despite the Peso devaluation, in spite of the market and the economy, that the growth of the Rio Grande Valley was not been impacted by those anomalies that took place in the economy. We have been able to consistently grow,” García told the online newspaper. The Edinburg EDC Board of Directors is comprised of Mayor Richard García as President, Harvey Rodríguez, Jr. as Vice President, Elías Longoria, Jr. as Secretary/Treasurer, and Richard Rupert and Dr. Peter Dabrowski as Members. Mayor Richard García and Edinburg EDC Executive Director Gus García. are not related. RESOLVED, That the chief clerk of the house forward official copies of this resolution to the president of the United States, to the president of the Senate and the speaker of the House of Representatives of the United States Congress, and to all the members of the Texas delegation to Congress with the request that this resolution be entered in the Congressional Record as a memorial to the Congress of the United States of America.